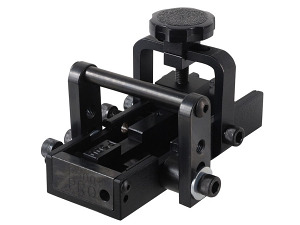 The B&J P500 Pro Universal Sight Tool is designed to remove front and rear dovetail sights on any semi-automatic handgun. One of the main improvements the Pro Edition offers over the original P500 are the newly designed hardened pusher tips and guide to prevent rotation which can mar the sights. Another improvement is a two position clamp that speeds up setup and prevents the slide from lifting or twisting as well as a newly added end plate to add strength and prevent the slide from shifting. Includes two pushers: one with a squared end for standard sights, and one with an angled end for tapered sights. Used the P500 to install new Trijicon sights on my S/A XDS and on a Glock 19. XDS sights were very tight, Glock not so much but the P500 handled both jobs easily; not a single mark or scratch on either gun.